Stay Cool at School addresses the range of emotions children experience throughout their day. Jumpy and Sunny help children identify their big emotions and use tools to cope. With practice, children become empowered to use their own set of coping skills. 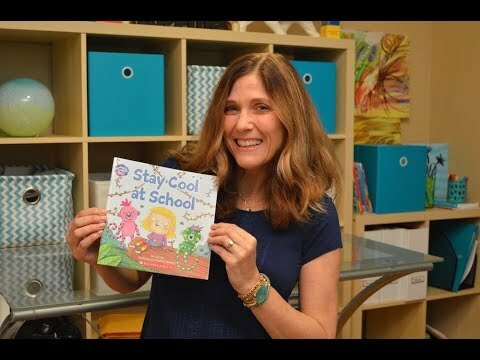 Stay Cool at School is available exclusively through Scholastic Book Clubs. Managing big feelings in a healthy way is something we can all learn. Even teachers, moms, and dads at times feel worried, frustrated, nervous, excited, angry, impatient, and embarrassed. This story introduces children to a variety of feelings and lets children know it okay to express their feelings. Jumpy and Sunny demonstrate how they manage their big feelings with healthy self-soothing techniques. Parents can integrate this story and its techniques into their family’s everyday life and bedtime routine. Teachers can use this book at school to create emotional awareness and ease transitions. It’s not always easy being mindful at school—or at home. In this funny, charming tale, two imaginary jungle friends show a child how to manage all kinds of energy and emotions! Stay Cool at School is a Club Originals book available exclusively through Scholastic Book Clubs. If your child’s teacher is participating in Book Clubs, you can order the book here by finding your child’s teacher or 5-digit class number. If you are not sure of the code please ask your child’s teacher. Introducing mindfulness to your class has never been easier with Scholastic Book Clubs new Mindful Me, Happy Me Series. In just one story, children learn about feelings and how to handle them in a way that will help your entire classroom become a calmer place of learning. Each order earns rewards for your classroom.